This week, we prepare for two great truths that shed light on everything we believe in as Christians: The death of our Lord Jesus Christ, followed by His glorious resurrection. Check the Weekly Bulletin section of the parish church site for both the Holy Week Services and the Student's Adoration and Veneration schedule. There are special Holy week services every day from Wednesday to Sunday. Consider attending as many services as you are able to as a family; either at our parish church or at your own parish. 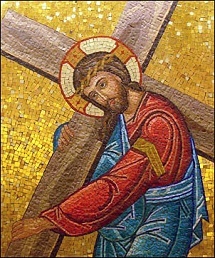 Find peace as you "lay aside all earthly cares" from this hectic and troubled world while quietly meditating at the Lord's grave on Good Friday or Holy Saturday. May the Risen Christ fill your hearts and entire being with His love.